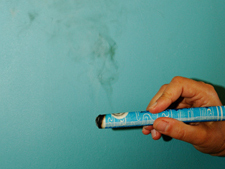 Flaming Needles or What Is Moxibustion? 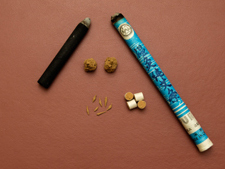 Moxibustion is the burning of the herb, artemesia vulgaris (Ai Ye in Chinese), commonly known as "moxa". The herb is burned on or near the skin of the patient to facilitate warming of an acupuncture point or group of points. Moxa comes in a variety of forms. The most common looks like a cigar, wrapped in paper with Chinese lettering on it. 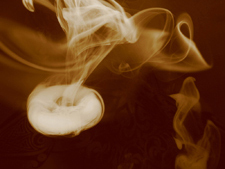 In this form, the end of the cigar is lit, and then held about 1-2 inches above the skin. The practitioner may move the stick, or may hold it still. This is done until the skin is warm to the touch and slightly pink in color. Moxa may be applied to an acupuncture needle. In this case, it may be in a smaller paper wrapped form, or may be loosely clumped onto the handle of the needle. It is then lit from the bottom of the herb, and the warmth spreads down the needle shaft deeper into the point. It also provides a pleasant warmth to the tissue around the point. Moxa may be used directly on the skin. In this case, clumps of the herb varying in size from a rice grain to a chestnut, are applied to an acupuncture point, and lit from the top. The herb is burned until the patient experiences a sensation of warmth which is perceived as uncomfortable, then snuffed out and/or removed. In China, some practitioners will allow the moxa to burn until a small blister forms on the skin. This is not considered to be acceptable practice in the United States, and is not done at Eastern Body Therapy. The moxa may also be placed on a slice of ginger, a layer of salt, a slice of garlic, or other herb before being lit. This allows for the properties of the additional substance to penetrate the point along with the artemesia herb. A common practice with direct moxa is to burn 3-5 cones until the patient feels a strong sensation of warmth, and the skin has become slightly pink.